Naoto Fukasawa, born 1956 in Yamanashi Prefecture, Japan, studied art and 3D-design at Tama Art University in Tokyo. He worked as a designer for Seiko-Epson until 1988 and for ID-two in San Francisco... Read more from 1989-96. After returning to Japan in 1996, he was head of the firm IDEO's Tokyo office . In 2003 he opened his own office, Naoto Fukasawa Design, in Tokyo. Since 2001, when he also became a consultant for the MUJI company, his primary focus has been the design of household products and electronic devices. In 2003 he created the brand "plusminuszero" (±0) for household objects. Naoto Fukasawa works for numerous European companies as well as large Japanese corporations in the consumer electronics industry. Together with Jasper Morrison, he organized the provocative and widely reviewed exhibition "Super Normal". 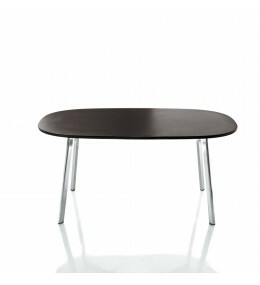 Déjà-vu Tables are the perfect modern solution for breakout areas, canteens, informal meeting areas or dining rooms.